Orga explosion proof battery enclosures are designed to safely and effectively house and protect lead acid and nickel cadmium batteries. On the outside we make them durable enough to withstand the severe environmental conditions they will have to face on your offshore platforms, while on the inside they provide the ideal environment for storing the batteries that underpin your vital back-up or main systems. Why do you need a battery enclosure? Batteries play an indispensable role in your offshore operations, either as a back-up to ensure the continuity of your key systems in the event of a mains failure, or even as a main source of power. Clearly, this in turn calls for the continuous integrity of your batteries. It means they have to be properly stored and protected at all times, which is exactly where Orga battery enclosures come in. When batteries are your only source of power, or in the unforeseen event of a mains failure, it’s reassuring to know that, thanks to Orga battery enclosures the continuity of your key systems, like your batteries, will be optimally covered. Why choose Orga’s battery enclosures? There are several excellent reasons for choosing an Orga battery enclosure. For optimum safety in the harshest of operational environments, for example, they are explosion proof and suitable for use in zones 1 and 2 gas explosion hazard areas. They are also certified for use with lead acid and nickel cadmium batteries. To provide the level of battery protection that meets your specific requirements, the external enclosure is available in either a hot-dipped galvanised steel or stainless steel configuration. Internally, they are provided with a non-static PVC lining. 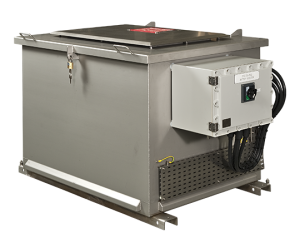 And last, but certainly not least, to cover just about every conceivable environmental eventuality, our explosion proof battery enclosures are good for temperatures ranging from minus 40 to plus 55 degrees Celsius.